Leveraging a vast experience, we are offering our clients with a gamut of Cable Jointing Kits, which is available for Indoor and Straight Joints and LT and HT Cables. These accessories are used for easy and hassle free joining of cables and hence, eliminate the requirement for maintenance. Clients can avail the these cable joining kits from us at industry leading prices. We are engaged in offering a finest quality range of Cable Joint Kits Epoxy. Our product range is perfectly manufactured as per the prevailing industry standards. Competitively priced, these products are appreciated for their unmatched quality and durability. While developing these products, our vendors also ensure to adhere to all the safety norms. Our association is a remarkable name in the industry for providing optimum quality range of Jointing Kits. Straight Through Kit provides suitable insulating and sealing performance and feature use of heat shrinkable and resin compound materials which make these deliver optimum functional working support. We are the preferred suppliers of indian railways and contractors for Thermoshrink Jointing Kits. We also supply Thermoshrink Jointing Kits for pijf cables. 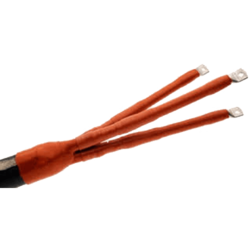 We are remarkable entity in this domain, we are engaged in manufacturing, trading, importing, exporting and supplying a wide array of Cable Termination Kits to our valued clients. •Widely used in various industrial application. We are offering Cable Jointing Kit. Our immense knowledge of the domain allows us to offer end termination kits, which are manufactured as per the industry standards. These termination kits include an exhaustive range of outdoor/indoor end termination (castex type).